Anti-piracy campaigns come and go every other month - most of them are either endlessly boring or end up becoming an object of ridicule. A new one just launched takes the form of a site which appears to offer free downloads from top artists, but with a twist. Clicking to download results in various pop stars meeting a grisly end by a bullet to the head or a careless hand grenade. Many anti-piracy campaigns of the last decade or so have been pretty entertaining in a twisted way, but if you’re the entertainment industries hoping to encourage change they have also been an almost universal failure. The entertainment factor has come from the fact that most of them, especially the “You Wouldn’t Steal a….” campaign, have been unintentionally funny and have provoked a whole stream of parodies. Undeterred, it’s now the turn of Chinese music publication RE:SPECT to go where no other anti-piracy campaign has gone before. With a fake website which looks like a ‘legitimate’ pirate download site, would be downloaders are suckered in to download music from their favorite stars. Sadly it’s not all fun for the multi-millionaire artists feature on the site as they end paying the ultimate price for their fans’ piracy. 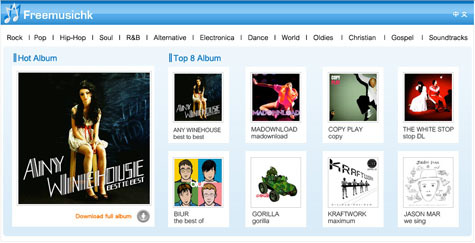 After clicking on an album cover, users are presented with a download button. Once this is clicked it is the start of a permanent good night for the unfortunate melody maker as they meet with a grisly end. Poor old Moby (below) avoids a couple of bullets but in the end gets his brains blown out. Other artists all meet their makers in slightly different ways either by bullet, grenade or other sundry explosion. Great fun for 2 minutes. The site looks good enough, but on closer inspection familiar album covers are recreated with different titles and look-alike stand-ins so we’ll presume – for the sake of sweet irony – that this decision was based on concerns over copyright (we doubt that Moby signed off on this). 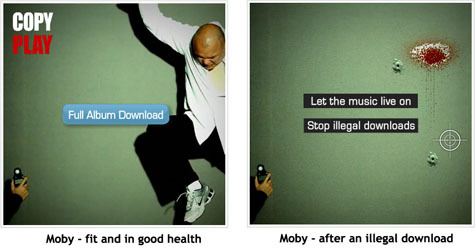 As anti-piracy campaigns go, this one is pretty good – in an entertaining kind of way. Will it stop people downloading though? Almost certainly not. FreeMusicHK can be found here.